There's nothing in this world like homemade granola---I love how dark you toast yours, that must have some intense flavor! i love this recipe. my adapted version of it features coconut palm sugar but that olive oil and sea salt. it's lip smacking. and you are right. it's dangerous to keep it on the counter top. i think i've eaten most of it out of the glass jar that holds it than for breakfast with yoghurt! This sounds so tasty! Yum! It's so funny but just as you posted this yesterday, I was making my first ever batch of Granola! Mine is sweeter though. Emma, this so cracked me up. I was just eating a bowl of homemade granola this morning and I had to hide the container way back in the cupboard so that I wouldn't snack on it all day. SO tempting! 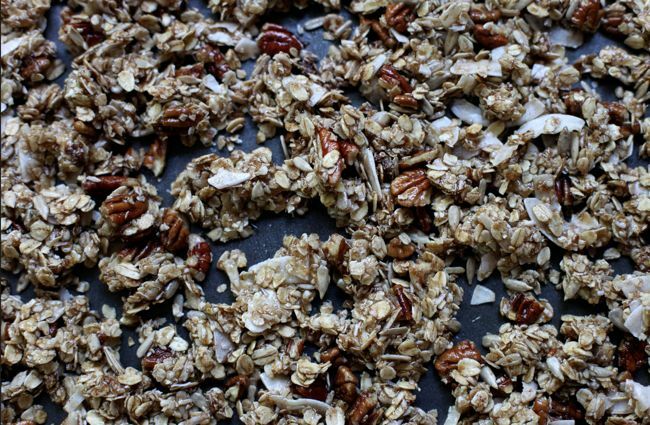 We've been making our own granola since we changed out diet and it's much better than any cereal you can buy. Like you I do snack on it during the day too. Looks fantastic, love these ingredients. Thanks for sharing this recipe! Sue - I think the photos probably enhance the darkness but it is nice and toasty - the honey seems to caramelise. You're right - homemade is something else. mehrunnisa - Coconut palm sugar sounds lovely - can you taste the coconut? I was wondering what it'd be like with coconut oil in place of the olive too. Katrina - It's so addictive! I hope you get to try making granola at home, it's really quick. Eileen - I like being able to chuck together a breakfast like this when I'm sleepy. Yogurt is definitely a good plan. GG - It's great to make at home - quick and you can adapt it exactly to your taste. Plus, as you say, it must be cheaper. C.K.B. - How funny! Which recipe did you use? I love the way it makes the house smell so good. 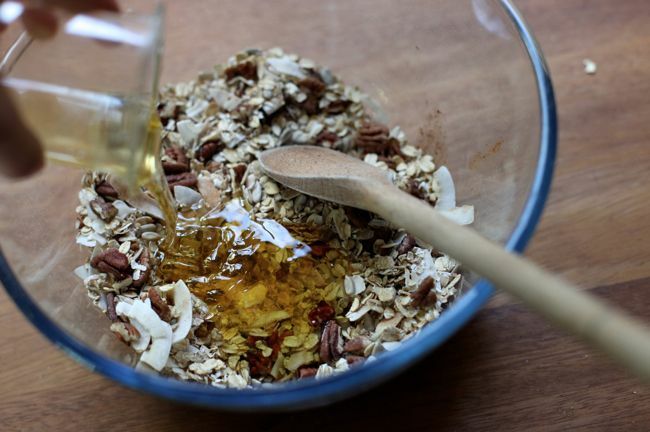 thelittleloaf - Hehe well that's the best thing about making granola - you can make it however you like it! My mum likes more seeds too. I do like pumpkin seeds as a change. erin @ yummy supper - I can just imagine you hiding it! It's so dangerous. Domestic Executive - I agree - it's definitely better than most bought stuff - though I did have some great types in California, but they were bakery/B&B made. Sarah - Thanks! I love how adaptable granola is to individual tastes. Hi Emma. I am glad you are still blogging. I made a version of this today. Delicious! The hard bit was waiting for it to cool before eating it! Thank you for sharing the recipe. This looks sooo delicious!! And congrats on your win, very well deserved!! Making this recipe now and I'm already licking the spoon! Can't wait to put on top of my morning yogurt. Thanks for sharing! I'm not sure - you could try it. I've never had much success with granola bars! You can carry this about in a little pot and munch on it that way.